00:35:00 Makes 6 servings, 1/6 recipe (272 g) each. Makes 6 servings, 1/6 recipe (272 g) each. Looking for a ground beef recipe using on-hand ingredients? 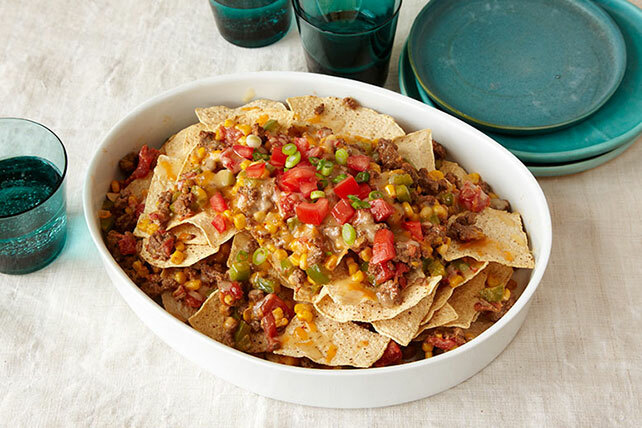 Our ground beef nacho casserole fits the bill. Brown meat in large skillet; drain. Return meat to skillet. Add tomatoes, corn, peppers, water and seasoning mix; stir. Cook 10 min., stirring occasionally. Stir in sour cream. Place half the chips in 13x9-inch baking dish; cover with layers of half each of the meat mixture and cheese. Repeat layers. Serve with a crisp mixed green salad. Omit water. Substitute 2-1/4 cups chopped cooked chicken for the browned ground beef. Garnish with sliced green onions and chopped fresh tomatoes just before serving. Stir 1 can (14 fl oz/398 mL) red beans, drained and rinsed, into cooked meat mixture with the tomatoes. Serving Size Makes 6 servings, 1/6 recipe (272 g) each.